Fig. 1. 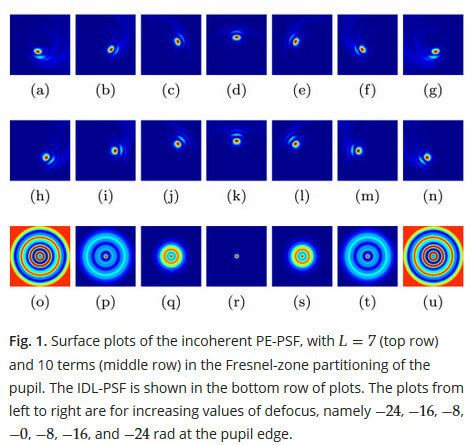 Surface plots of the incoherent PE-PSF, with L=7 (top row) and 10 terms (middle row) in the Fresnel-zone partitioning of the pupil. The IDL-PSF is shown in the bottom row of plots. The plots from left to right are for increasing values of defocus, namely −24 , −16 , −8 , −0 , −8 , −16 , and −24 rad at the pupil edge. Professor Sudhakar Prasad was awarded a US Patent for his work on Rotating Point-Spread Function Design for Three-Dimensional Imaging based on the use of angular momentum of light in May 2016. He is being recognized for this invention by UNM's Science and Technology Corp. at an Innovations Award Ceremony on April 4th. The Rotating PSF technology can lead to improved 3D source localization with potential for exciting applications to high-resolution biomedical microscopy and diagnostics as well as remote sensing. An excerpt from STC's Technology Highlights appears here.